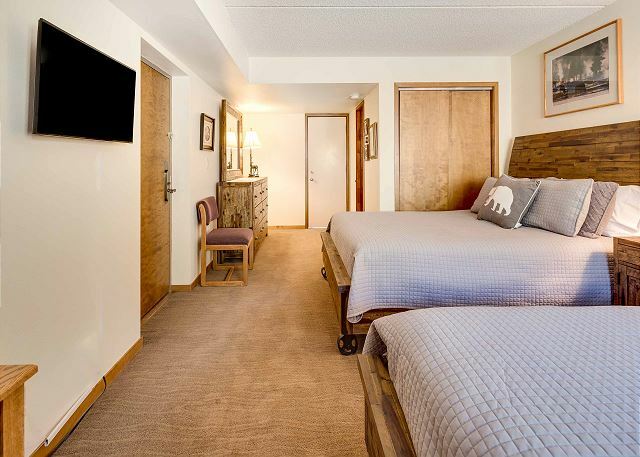 After skiing, you'll still enjoy warm sunlight for your apres-ski session. 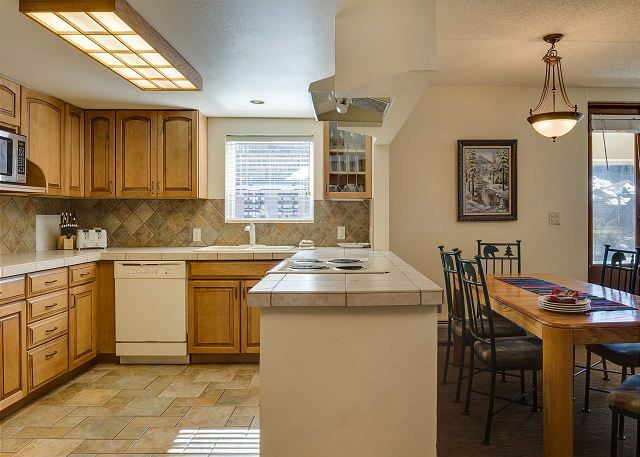 Cook your meals and congregate in the huge kitchen. Counter space galore! That's not a picture above the sink...it's the view of the American Eagle lift!! 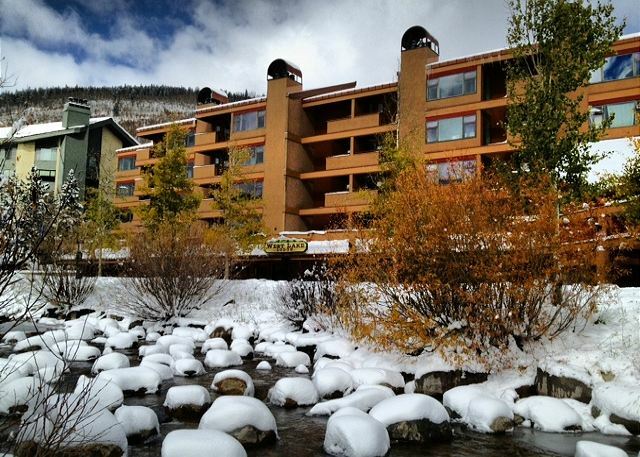 Your winter view of the ski slopes - gorgeous! Can you imagine a better view while enjoying your morning coffee? Bubbling hot tub for apres ski. 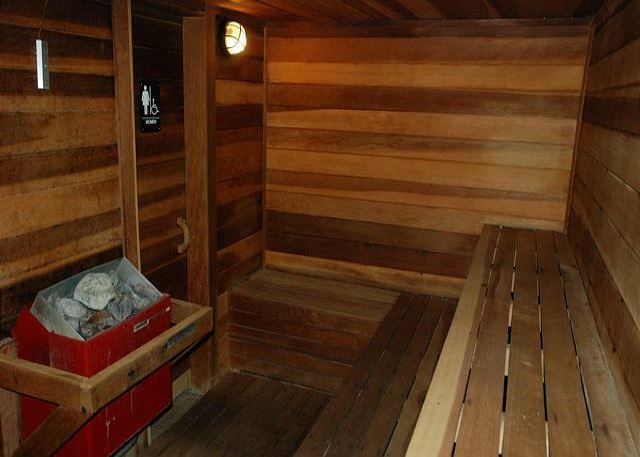 Relax in this dry sauna or the nearby steam shower. The gorgeous Gore and Ten Mile mountains beyond Westlake Lodge. Westlake pond in the foreground where there's ice-skating in the winter. 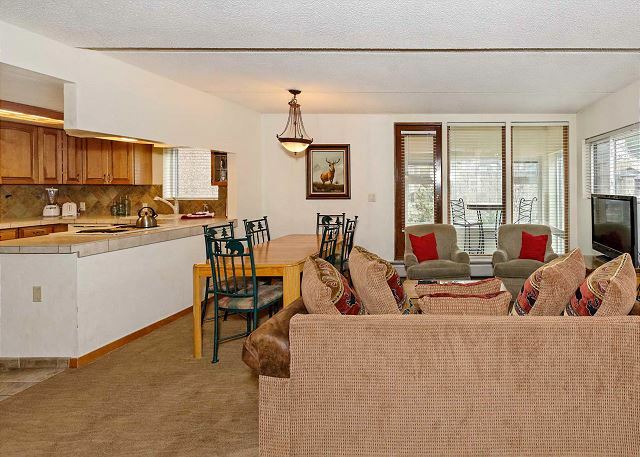 Families and groups love the big kitchen and wide-open living area in this large two-bedroom condo at Westlake Lodge, and so will you! 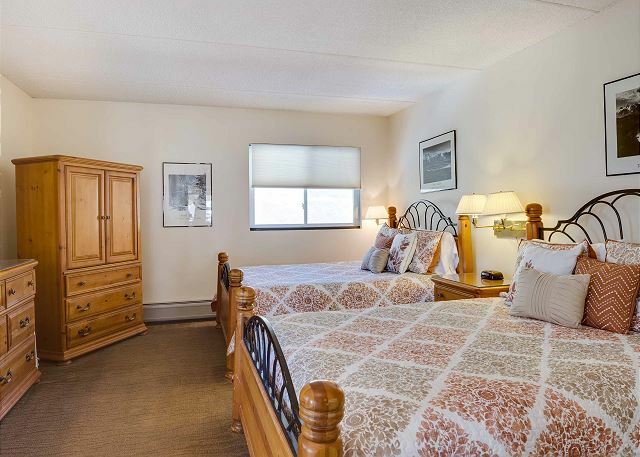 There are huge closets to stash your luggage and gear and there's new carpet throughout the condo, which sleeps up to 10 people in two big bedrooms, a memory foam sofa bed and two full bathrooms. Once you've parked in the heated underground garage, hook up to the free wifi and enjoy the view from the glassed-in deck, including the mountain. 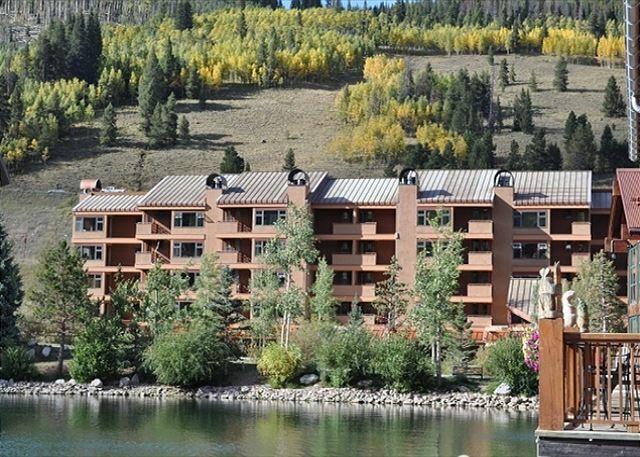 In the summer, you might spot an angler scouting for trout in Tenmile Creek, right in front of Westlake Lodge. With flatscreen TVs in the living room and both bedrooms, you won't miss a second of the game, and the kids can watch their shows tucked away in one of the roomy bedrooms. Since this is an end unit, it even has two balconies, with the walk-out patio in the master bedroom featuring sunset views of Vail Pass. 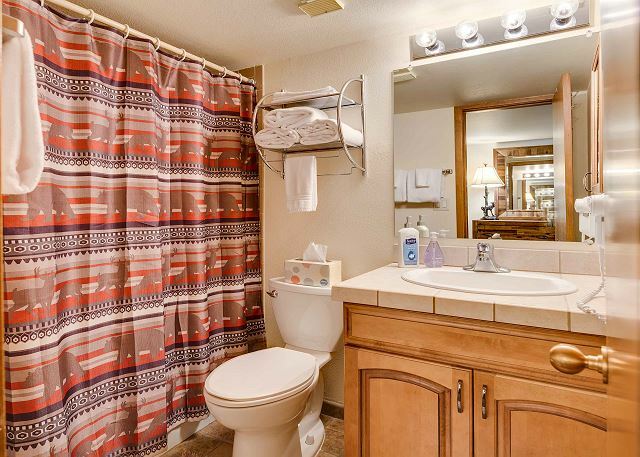 The two full baths are well-stocked with towels and toiletries, and in the kitchen you'll find everything you need, whether you're fixing a simple apres ski snack or a gourmet dinner. 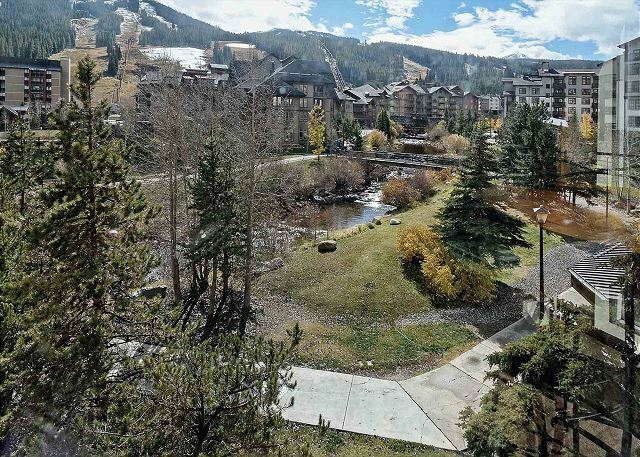 Westlake is easy to drive to, right along Copper Mountain's main drag, and once you're in, it's just a short walk across the creek and past the pond to the heart of Center Village and the high speed lifts. On your way back from the slopes you might catch locals playing broom hockey on the ice, or stop in and say high to some of the mountain workers at the nearby Mexican tavern. 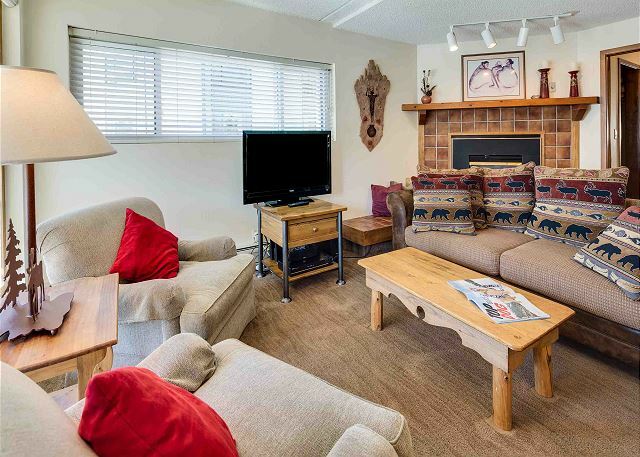 After a fabulous day skiing, riding or snowshoeing, warm up in front of the gas fireplace, and relax with a movie on the HD flatscreen TV with DVD and Surround Sound in the living room. 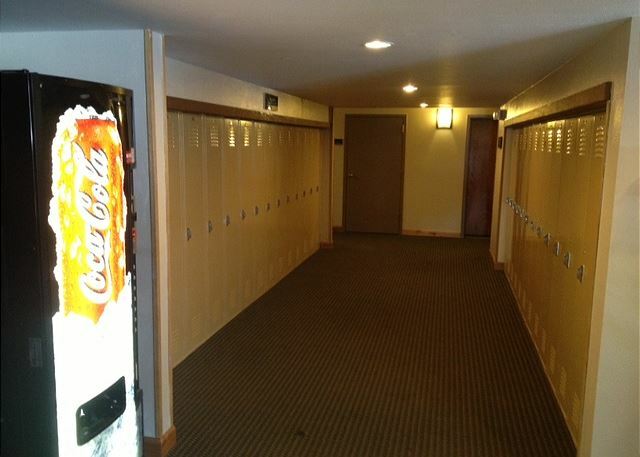 During ski season, you'll store your skis and snowboards in ski lockers just inside the front door of the building. Parking is under the building with elevator access. 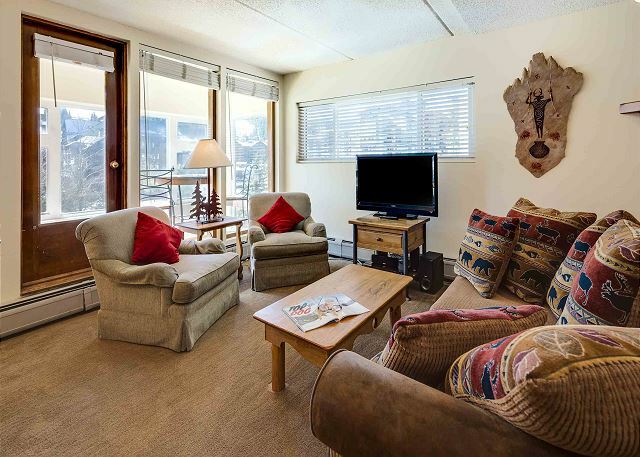 West Lake Lodge is ideal for anyone who enjoys the convenience and après environment of slope side accommodations! 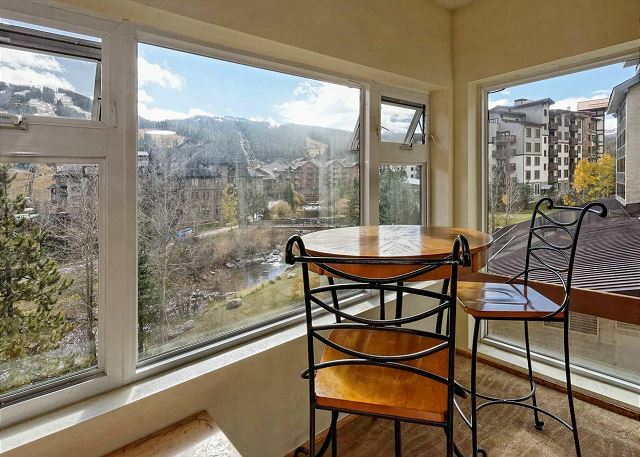 This condo is not ski-in, ski-out, but it's just a short, less than 5-minute walk to the American Flyer lift in the center village. The 4 beds was nice and spacious for 4 people. Wish it were a little closer to the slopes, but wasn't too far. Like the lockbox (instead of having to stop at another location to get a key). Condo met all of out expectations. Nicely stocked to cook your own food. Great location. Garage parking, great views of the ski slope. The beds were a bit firm for our likings but others may prefer that. We had a very nice stay. 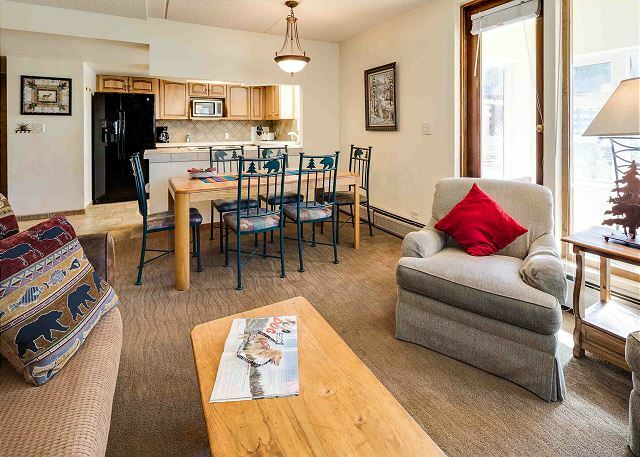 The condo is nicely located in Center Village enabling us to walk to the lifts. 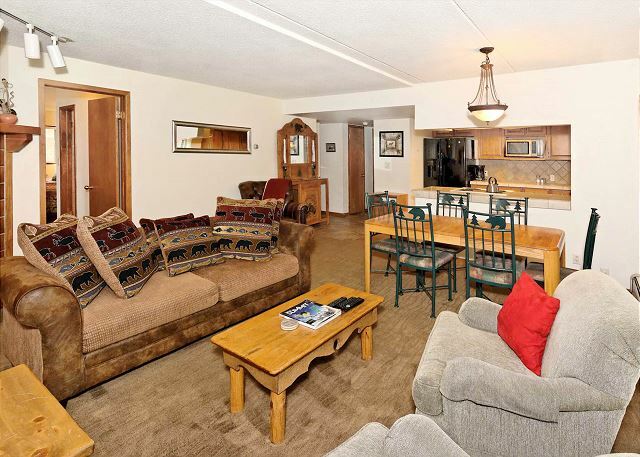 You sit in the room and you watch the slopes and the beautifully lighted lake. The place is clean and roomy and has inside parking. We had everything we needed to enjoy breakfast and lunch. We chose to eat out for dinner. There are nice places to walk to or we often ventured to Frisco for their many fine restaurants. This condo was perfect. We could watch all the activity of the center village including the American Eagle and American Flyer lifts. At night, you can watch the snow cats on the mountain. In the morning, we could walk to the lifts. It was well equipped with everything you need. Great Stay in December 2016! Our group of 4 enjoyed the location and views! We loved having our coffee in the sunroom overlooking the American Eagle lift. All the key amenities were stocked (the box fan and humidifier were really helpful) and the rooms were nice and clean. The only con would be the beds were a little stiff (maybe some toppers would help) but still provided us a nice rest. Would stay again! We had 5 guys on the tpip. The 4 queen beds and sleeper couch worked perfect. Everyone got equal accommodations. Location was great, easy access, never a problem with traffic. Easy walk to the lifts, restaurants and bars. 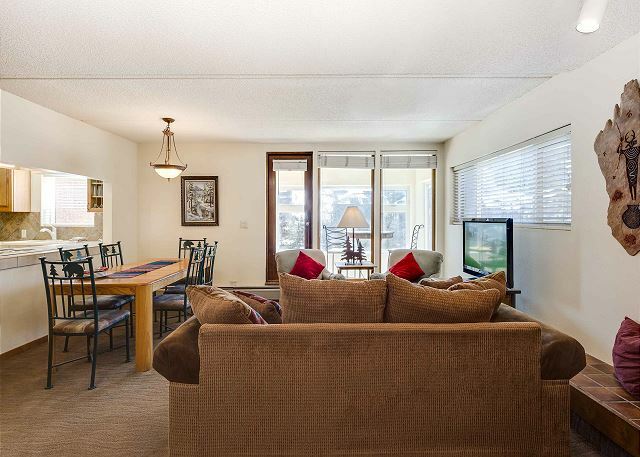 Loved this condo: well furnished and maintained, very good location (easy walk to American Flyer lift and Central Village stores/restaurants), nice sun-room with view of the mountain. 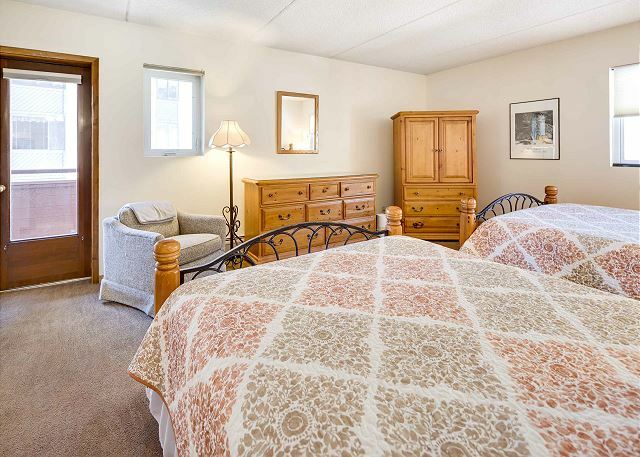 I liked having two bedrooms each with its own bathroom and 2 queen beds, made the stay very easy for two families. Will hopefully be back next year. We love this condo. It is very large, especially the bedrooms. Having two Queen beds in each bed room is hard to find. We enjoyed the games that were in the room and the room was well stocked with needed supplies such as shampoo etc. It is a tiny bit of a walk to the lift which was a bit hard with small children but it was definitely worth the roominess of the room.